what the businesses in our area have to contend with. He saw firsthand how a second rate cleaning job impacted day to day work and the overall perception of any company, and he formed Consistently Clean as a commercial cleaning and janitorial service that runs as efficiently and assuredly as the businesses with which he works. for commercial cleaning and janitorial services on Cape Cod. 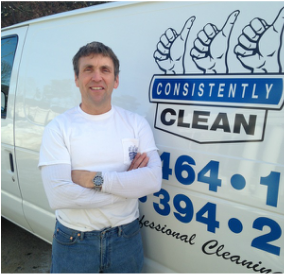 Trust in our janitorial service is a critical component of the consistently clean mission throughout Cape Cod. Our company and our people are dedicated to ensuring the trust you place in us is well deserved. Our experienced and skilled staff take part in company-wide training to perfect our skills. Background checks are run on all our job applicants. All offices we clean are checked by senior staff to make sure that every element of the job is done right. Over the years, our team's hard work has paid off. The honesty, reliability and consistent, quality office cleaning and janitorial service has helped us become the go-to full-service commercial cleaning service on cape cod. We accommodate your schedules, are flexible to your needs and will work with you to ensure you have the service that works best for you. Yes, consistently clean is a janitorial and office cleaning service that is built for your business. Consistently Clean is ready to work for you! for your commercial cleaning and janitorial service! We are fully bonded and insured, and provide office cleaning and janitorial services to the entire Cape Cod MA area, including Barnstable, Falmouth, Yarmouth, Sandwich, Bourne, Dennis, Mashpee, Harwich, Brewster, Chatham, Eastham, Hyannis, Orleans, Osterville, Plymouth, Provincetown, Sandwich, Truro & Wellfleet.